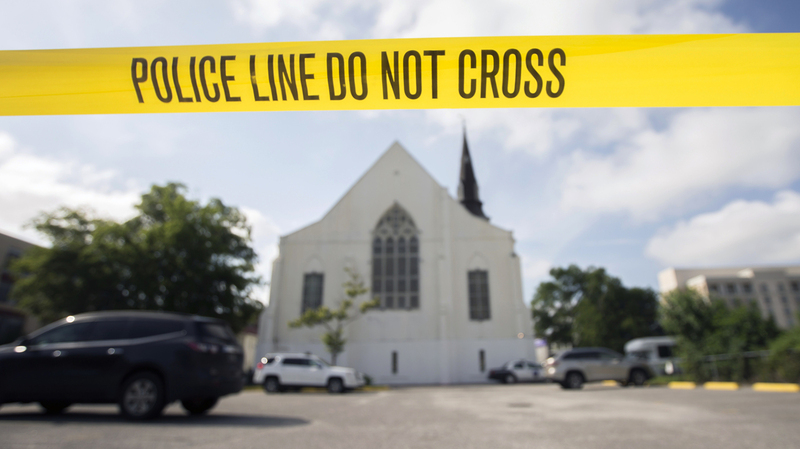 Should NPR Be Calling The Attack In Charleston 'Terrorism'? : NPR Public Editor A listener questions NPR's policy on labeling crimes as "terrorism." Should NPR Be Calling The Attack In Charleston 'Terrorism'? Police tape surrounds the parking lot behind the AME Emanuel Church as FBI forensic experts work the crime scene. Is the killing of nine people at a black church in Charleston, S.C. on Wednesday night "terrorism" and should NPR be calling it such? Jeffrey Fields, assistant professor of the practice of international relations at the University of Southern California, wrote to my office last night, asking, "Why the resistance to characterizing the shooting of June 17 in Charleston, S.C. as terrorism?" "By any stretch and using any of the definitions including the State Department's or 18 U.S.C. § 2331, this is terrorism," he wrote, in part. "Why is NPR (and so many other media outlets) 'avoiding' using this term? It only serves to reinforce the notion that terrorism equates to Muslims and foreigners. Yes, this is a hate crime. That doesn't preclude calling it terrorism either in common parlance or legal terms." Fields, in his letter, pointed out that NPR, in its initial reporting on the Boston Marathon bombings, " at least acknowledged that President Obama had avoided using the term. That's very telling because 1. NPR hasn't done that with Charleston and 2. At that point the bombers in Boston hadn't been caught or identified (so motive and intention were still unknown). Here the alleged perpetrator has been caught and there are already reports of his own words suggesting his motivation and it points directly to the textbook definition of terrorism." Mark Memmott, NPR's standards editor, told me NPR's policy is to avoid rushing to throw a label on a situation. "We use action words to describe what happened and let the facts reveal whether it was terrorism, a hate crime, or murder," he said. He added, "We're certainly not going to shy away from reporting what is revealed about the suspect and his motivations." I looked back at the Boston reporting and how NPR reported on day one of other similar acts of violence. In the case of the Boston coverage, in addition to the story Fields cited there were a number of stories on that first day quoting officials using the word to describe the situation. My quick takeaway is that NPR has been largely consistent in its policy. When the word "terrorism" pops up early on, it's because someone else, usually an elected or law enforcement official, has used it. Moreover, NPR's policy seems appropriate to me, at least for the moment. The coverage that Fields was objecting to was from the first day after this week's horrific events. While NPR itself did not refer to the suspect as a "terrorist" or call the killing "terrorism," several stories, beginning yesterday afternoon, have quoted people using the word to describe the situation, and that also seems appropriate. The situation is already evolving. Late this afternoon, NPR reported that, "the Justice Department said it was investigating Wednesday's shootings as a possible hate crime and an act of domestic terrorism." As the coverage unfolds I'll keep track of how NPR's language does as well, and revisit the subject, if warranted. Meanwhile, for more on "what this story tells us about the deeper foundations of racial hatred in America" read this piece from NPR's Code Switch blog.